Spring 2019 will be the Healthy Youth Program's final season of our current local programs. Thank you, deeply, for all of your support and partnerships throughout the years as we have come together to help build a healthier community. For our Spring program line-up and links to registration, please visit our Programs page. Our Mission: Empowering youth and their families to achieve optimal health through hands-on education. The Healthy Youth Program is an outreach branch of the Linus Pauling Institute. At the Healthy Youth Program we believe all children should have equitable opportunities to eat healthful, nourishing foods, and to have the tools and resources needed to grow and prepare these foods. We offer cooking, nutrition, and garden-based programs for youth (preK through grade 12) and families throughout our local communities, with a focus on partnerships to maximize impact and reach youth and families most in need. Many of our programs are based in school vegetable gardens, linking a healthy and active lifestyle with a healthy and sustainable environment. We engage children and families through participatory education, hands-on activities, and interactive dialogue. All of our programs are youth and family centered, tailored to their unique needs, and build on the strengths of the participating youth and families for long-term success. The Healthy Youth Program is a healthy lifestyle program for children (preschool through grade 12) and their families. Many of our programs are based in school vegetable gardens, linking a healthy and active lifestyle with a healthy and sustainable environment and providing fresh produce for families in need. We engage children and families through participatory education, hands-on activities, and interactive dialogue. All of our programs are youth and family centered, tailored to their unique needs, and build on the strengths of the participating youth and families for long-term success. To recieve emails about nutrition, cooking and garden programs join our email list HERE. Full and partial scholarships are available for all programs. Applications and more information can be found HERE. For a taste of our programs, please check out our PROGRAM PHOTOS! Looking for ways to help with these and other programs? We have many opportunities to GET INVOLVED! Paid registrations cancelled at least one week before the start of classes or camps will receive a full refund*. If you cancel after that time, your payment will not be refunded. The Healthy Youth Program does not issue partial refunds for registrations canceled by participants**. *If you paid by credit card, your refund will be issued promptly. If you paid by check, it may take up to 6 weeks for you to receive your refund check in the mail. **If the Healthy Youth Program cancels an entire class or camp, a full refund will be issued; if the Healthy Youth Program cancels a portion of a class or camp, a partial refund will be issued. Your child(ren)’s safety is our top priority. We also understand that being a parent means that things do not always go as planned. While we can accommodate the occasional late pick-up within reason, please read our official policy at the link above. Because Spring 2019 will be the final season of current local programming by the Healthy Youth Program, we will not be offering summer camps this year (summer 2019). We apologize! The Healthy Youth Program strives to make programs as accessible as possible. We off both full (100% registration costs covered) and partial (50% registration costs covered) scholarships for all programs. To apply please fill out and return a a scholarship application. 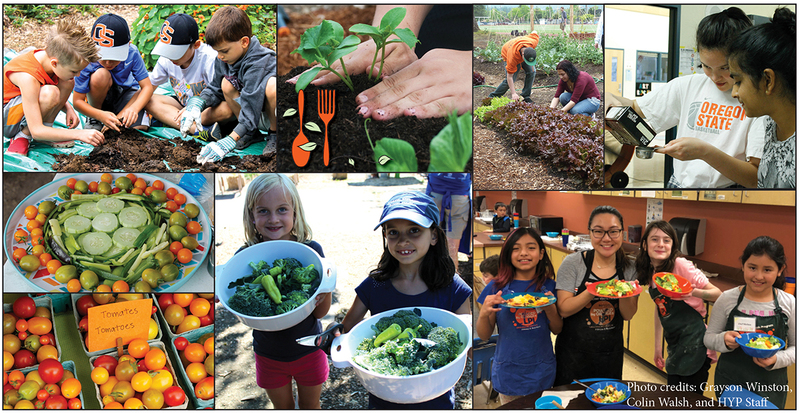 The Healthy Youth Program manages three school gardens in Corvallis where we work with students, teachers, and volunteers, host our classes, workshops, and camps, and provide fresh produce to families in need. Lincoln Garden, located at Lincoln Elementary School in South Corvallis, is a gathering place for children and families to learn the connection between a healthy environment and a healthy lifestyle while growing, preparing, and enjoying fresh produce. During the school day, Lincoln Garden is an outdoor classroom for Lincoln Elementary students. Healthy Youth Program garden educators provide garden-based activities connected to state standards that enrich curricula. After school, Lincoln Elementary students participate in Lincoln Garden Club, where they explore the joy of gardening and taste its rewards. Volunteers from OSU, Lincoln parents, and the community help to maintain Lincoln Garden through monthly work parties (Tend, Mend, and Mingle/Cultivamos y Charlamos en el Jardín), and during the summer the garden is cared for through our High School Summer Internship program. Visit the sections below to learn more about Lincoln Garden! Nutritional information for fruits and vegetables grown at Lincoln Garden can be found here: Garden Signs. Kid Friendly Gardening Tip: Kids like veggies that they can eat raw. Plant colorful, fun varieties like cherry tomatoes, lemon cucumbers, mini-bell peppers, easter egg radishes and dinosaur kale! NEW: Monthly Garden Work Parties at Lincoln Garden! The Healthy Youth Program invites you to join us once a month for Tend Mend & Mingle in two of our school gardens. These events are a chance to gather to work on garden-related projects, and build community through hands-on/minds-on service learning projects. 3. Enjoy light garden work, snacks and coffee! Contact hyp@oregonstate.edu or visit our website for more information. The Healthy Youth Program has partnered with Linus Pauling Middle School (LPMS) to manage the Pauling Pride Garden and increase student participation in this outdoor learning space. Through a collaboration with the 8th grade STEM classes, the Healthy Youth Program Garden Educator provides opportunities for LPMS students to explore their garden, learn how to grow fresh fruits and vegetables, and investigate the important link between a healthy environment and a healthy lifestyle. Monthly Garden Work Parties at Pauling Pride Garden! No work parties in Dec/Jan. The Healthy Youth Program partnered with Corvallis High School (CHS) to develop the Spartan Garden, which serves as a place-based outdoor learning resource for the school. In the Spartan Garden, students of all ability levels learn where their food comes from and the value of eating plenty of fresh fruits and vegetables. Spartan Garden produce is used for healthy snacks during lunch and break, in the school cafeteria, and is given to any students helping to maintain the garden. Our Chefs in the Garden summer day camps help keep the Spartan Garden vibrant during the summer, and any excess produce is donated to area food banks. Visit the sections below to learn more about the Spartan Garden! For more information, and to GET INVOLVED, visit our new webpage for high school internships! English Language Development students learned about gardening as a hobby and working outdoors as a career choice. The Spartan Garden also provides students with opportunities for Service Learning, to fulfill their Career Shadow Experience and Extended Application requirements, and to earn credit for Internships and Structured Work Experience. Please contact the Healthy Youth Program if you are interested in incorporating the Spartan Garden into any of your required career-related learning experiences at CHS! Many adolescents have developed unhealthy eating habits and eat few or no fruits and vegetables on an average school day. According to the Oregon Department of Human Services, only 18% of 11th graders in Oregon consumed the recommended 5+ servings of fruits and vegetables per day. Our children and adolescents are constantly exposed to fast-food commercials, snack and soda vending machines, and other unhealthy calorie-rich snack foods. We need to find a way to teach our adolescents to make food choices that will nurture their bodies and help them stay healthy. There is no quick-fix for unhealthy eating habits, including the overconsumption of calories, but through a school garden we might get adolescents into another kind of relationship with food by teaching them where their food comes from, the value of eating healthy foods, how to respect and take care of their environment, and the nurturing effects of preparing and eating a meal together with families and friends at the table. In addition, studies have found positive impacts of school gardens on eating and exercise behaviors as well as improved academic performance and attitudes towards learning. 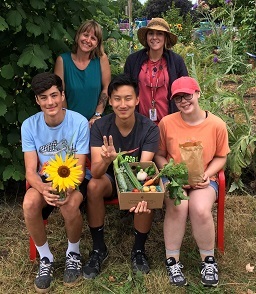 To address this, the Linus Pauling Institute's Healthy Youth Program partnered with Corvallis High School (CHS) to develop a school garden that will be maintained by the high school students throughout the school year. The garden is located on an empty lot south of the football field and the track. Corvallis High School serves as the magnet school for all life skills students in the Corvallis School District. Construction of a paved area for accessible raised table beds was accomplished through volunteers of the 2012 OSU Alumni Association’s Community Day of Service. More than 45 volunteers showed up for the 2012 OSU Alumni Association's Community Day of Service project at the Spartan Garden! Our annual plant sale features vegetable and herb starts grown with organic methods by the Healthy Youth Program team and students at Linus Pauling Middle School. We will also have beautiful flower baskets available! Proceeds from our annual Plant Sale Fundraiser help support school gardens managed by the Healthy Youth Program (specifically, school gardens at Lincoln Elementary School, Linus Pauling Middle School, and Corvallis High School); and help support our Urban Farm Interns (high school students helping to tend school gardens in the summer)! Saturday we will be at Lincoln Carnival with plants for sale and games for families! Location: 110 SE Alexander Rd. OUR SCHOOL GARDEN VEGGIE BOX SUBSCRIPTIONS ARE FULL FOR 2018! Interested in receiving a weekly box of local fruits and vegetables grown and harvested by high schoolers at school gardens in Corvallis? Sign up and support the CHS Urban Farm Summer Internship Program! All fruits and vegetables are produced using organic methods (although not certified organic). You must be able to pick up your box during one of the open garden hours, listed below. Be able to volunteer during the open garden hours, listed below. Interns with the Healthy Youth Program have the opportunity to gain professional experience in the areas of nutrition education, garden education, community food systems, urban agriculture, and community outreach. Volunteer positions and internships vary from term to term depending on the quantity and types of programs being offered by our organization, and the internship requirements of students. Internships do not need to be through your department or program, but in many cases can be completed for credit. During the school year, the Healthy Youth Program can host approximately two student interns who are seeking experience in nutrition and garden education. The HYP can also host a Small Farm Urban Agriculture Intern each term including the summer. Each summer, the Healthy Youth Program offers full-time (360 hour/10 week) internships for approximately 5 - 7 students facilitating nutrition- and garden-based summer camps. If you are interested in interning with our organization please email hyp@oregonstate.edu. The Healthy Youth Program is seeking students interested in agriculture education, horticulture, greenhouse management and the like for our Small Farm Urban Agriculture Internships. This is an exciting opportunity to help manage local school gardens and greenhouse for both education and production. Internships are unpaid, but may be for credit depending on department/major requirements. Description: The HYP Manages three school gardens in Corvallis at Lincoln Elementary School, Linus Pauling Middle School(LPMS) and Corvallis High School(CHS). As a part of our management of these spaces we host monthly work parties in the gardens for parents and community members. These gardens also provide produce for school cafeterias, HYP cooking classes, and local families, as well as serve as a space for students to learn and explore. The HYP also hosts an annual plant sale with herb, vegetable and flower starts grown in the LPMS greenhouse. Student Small Farm Urban Agrictulture Interns work with the garden manager and garden assistants to maintain these garden spaces and manage greenhouse plant starts for the spring plant sale. 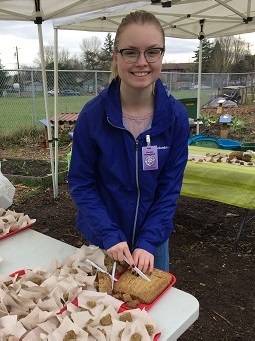 Student intern will work closely with the garden manager to maintain gardens located at Lincoln Elementary and Corvallis High School. Oversee irrigation and compost systems, and weed and pest management at school gardens. Assist with planting and harvest schedules including some management of the Lincoln greenhouse. Manage/assist with volunteer work parties and community groups in the gardens. Work with garden manager on other projects related to design and maintenance of garden spaces. Assist with planting, thinning, up potting seedlings and starts at the LPMS greenhouse. Participate in volunteer work parties with community groups in the greenhouse. Work with garden manager on other projects related to maintenance and coordination of the greenhouse. There are currently no OSU student positions available with the Healthy Youth Program. Please check again soon! The Healthy Youth Program (HYP) offers a variety of classes, camps and events for the community throughout the year. Our cooking and garden programs are held off campus within the Corvallis area, often in local schools. We are able to offer these programs thanks to strong support from OSU student and community volunteers. Volunteers can be involved in our programs in a variety of ways - from one time volunteer opportunities, special events and garden work days, to assisting with a program regularly for a term or full academic year. To recieve updates on volunteer opportunities, sign up for our Volunteer Announcements HERE! 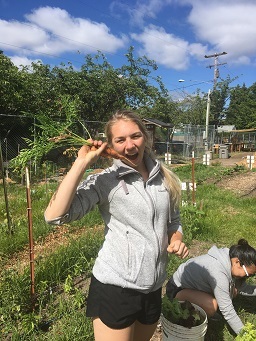 If you are interested in one-time volunteer opportunities for yourself or your organization, consider coming to our regular garden work parties called Tend, Mend and Mingle at Lincoln Elementary and Linus Pauling Middle School Gardens! Tend, Mend and Mingle: coffee and snacks provided! If you are interested in volunteering on a regular basis, please fill out a volunteer application(instructions below). The following descriptions are meant to give you an idea of the opportunities associated with general program areas. Please contact hyp@oregonstate.edu if you are interested in learning more about a particular program or volunteer opportunity. Description: The Healthy Youth Program (HYP) offers year-round afterschool cooking classes for elementary and middle school students. 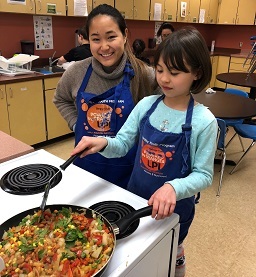 In our classes, youth are actively involved in the cooking process including reading recipes, learning about kitchen safety, and exploring new foods. HYP cooking classes are designed to give youth a hands-on experience in the kitchen. Volunteers and interns will provide guidance and support for a small group of “student chefs” at each class. Description: The HYP offers garden based program at Lincoln Elementary School, Linus Pauling Middle School and Corvallis High School. Volunteers and interns help with garden based programs and events including afterschool Garden Club for elementary students at Lincoln Garden in the fall and spring, all-school garden days at Lincoln Garden held each term, and SPEAR (Students Personally Engaged in the Agriculture Revolution), an elective class taught by the HYP Garden Manager at Corvallis High School. Description: The HYP supports initiatives that promote healthy youth and families by sitting on planning committees, advisory boards and workgroups and participating in community events. Student interns and volunteers work with HYP staff to table at events, update outreach materials, and promote local programs and resources. Volunteers and interns may be involved in a variety of outreach projects including creating newsletters, taking photos at events, and managing HYP social media accounts. Garden Education Programs/Small Scale Urban Agriculture Application PLEASE NOTE: We are currently seeking Garden Steward volunteers to help with basic up-keep of school gardens, and helping to keep the gardens tidy. This is approximately a 2-3 hour per week commitment. Nutrition/Cooking Education Application PLEASE NOTE: We are currently seeking volunteers to help with our after-school cooking classes! ALL positions require a Criminal History Check. The Healthy Youth Program, while not a part of the Corvallis School District(CSD) offers programming in schools during regular school hours and in the CSD facilities after hours. Since you will be volunteering on school property often working directly with youth, you are required to register yourself as a volunteer with the district, this volunteer application also serves as a criminal history check. If you cannot complete our application online, please call us to request a paper application. To register for C.H.E.F. cooking classes, please scroll to the bottom of this page! The CHEF Project is a three-year grant awarded to the Coast to the Cascades Community Wellness Network to implement the Culinary Health Education and Fitness (CHEF) Project in three counties in western Oregon. The overarching goal of the CHEF Project is to assist the children and families of Lincoln, east Linn and rural Benton counties attain higher quality of lives free of preventable disease due to illnesses related to poor nutrition and obesity. The five-week culinary education courses will provide experiential nutrition-focused culinary education to over 1,500 children and families. The CATCH program is a comprehensive physical activity and nutrition education program that teaches children the importance of healthy eating and physical activity to improve overall health. CATCH will increase physical activity levels of elementary and middle school children in targeted rural communities. In addition, students will be exposed to new fresh fruits and vegetables through programs like Tasting Tables, which provides samples of fresh fruits and veggies in schools and Pick of the Month, which highlights seasonal fruits and veggies. CATCH will serve at least 1,700 children in Lincoln, east Linn and rural Benton counties. Together these programs will build a culture of health in our rural communities. The Culinary Health Education portion of this grant in east Linn and rural Benton counties will be implemented through a partnership between the Healthy Youth Program and the College of Osteopathic Medicine of the Pacific Northwest (COMP-NW). Healthy Youth Program staff will train Doctor of Osteopathic Medicine students in the Lifestyle Medicine track from COMP-NW to teach our five-week cooking curriculum in east Linn and rural Benton county communities between 2018-2021. We are excited to collaborate with Samaritan Health Services, COMP-NW and the Coast to Cascades Community Wellness Network to better meet the needs of Oregonians by expanding our outreach programs to rural parts of Linn and Benton counties. COMP-NW students will make up a large portion of our volunteer base, but volunteer positions in these classes are open to anyone interested in health promotion who is able to commit to attending all five classes in a given five week session. Interested in volunteering to lead CHEF cooking classes? Read more about the CHEF Program in this recent article in the Albany Democrat Herald. Candace Russo, MS, is the Manager of the Healthy Youth Program. She has 20 years of experience in youth and family education and outreach, and has enjoyed gardening and healthy eating since she was a child. Candace started her work at the Healthy Youth Program in 2011 as the Garden Manager, sharing and exploring the process of “soil to seed to plate,” which highlights environment and lifestyle links between quality soils, nutrient-rich food, and healthy bodies. As Program Manager, Candace is committed to developing the belief of the Healthy Youth Program’s founder, Simone Frei, that “it takes a village” to fight childhood obesity and raise a community of healthy, happy, and active children. Through community partnerships, Candace strives to further develop strength-based youth and family programs that support sustainable and long-term behavioral change, the foundation for the Healthy Youth Program’s core values. In addition, she manages the Healthy Youth Program's three school gardens, and contributes art and design work. Candace is also a lucky mom to two young, loveable, giggly daughters; one of her favorite places to be is in the backyard garden, getting their hands dirty as a family. 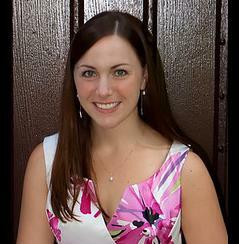 Julie Patterson Jacobs, BA, is a Nutrition Educator for the Healthy Youth Program. She has a background in teaching and mentoring children of all ages. Her nutrition education, through the Cleveland Clinic, led her to become a nutrition coach, which she has been doing since 2011. She is eager to combine these various skills into a single position as a Nutrition Educator. She enjoys sharing the principles of healthy living with others through the practice of healthy eating and exercise. Julie loves to play sports, like soccer, and hiking with her husband and dog. She is also a certified Zumba instructor, which keeps her moving and grooving every day! As a Nutrition Educator for the Healthy Youth Program, Julie is involved in educating children and families about healthy living using the evidenced-based nutrition research from the Linus Pauling Institute. She leads cooking classes at the programs' various garden sites and in the schools during the school-year. She loves cooking with the wonderful kids and families of this great community. Aliesje King, MA, is passionate about Food and Social Justice, Seed Sovereignty, community connections, and bringing people closer to the place we live and the food we eat. She started her adventures in outdoor, experiential, and Place-Based education. Since then, she worked collectively and independently to create programs and adventures for adults and children alike that foster a creative, and hands-on approach to learning in the nature. She is an AmeriCorps Alumna, an urban gardener, and spent over 10 years in the food industry. She was the founding director of Earth Art Ag, a school garden education program in Portland, Oregon. Additionally, she has worked internationally with women farmers, and on a local small scale seed farm. She is also currently managing the Albany Farmers Market, and growing food and starts with a small farming collective. Gerd Bobe, PhD, MPH, and MS, is the Faculty Advisor of the Healthy Youth Program. He has more than 10 years of professional experience in public health nutrition, specifically dietary disease prevention. His passion is to “translate scientific knowledge into healthy choices” and support people to be successful and achieve their goals. He works with the staff of the Healthy Youth Program to evaluate family and youth programs to better serve our communities and families. He believes that empirical and evidence-based theoretical approaches ensures better formulation and evaluation of effective and efficient health programs to influence health behavior among individuals and populations as “better theories lead to better practices”. We are happy to announce that Brain Breaks 2: Classroom Fitness for Children is on sale now! Brain Breaks 2 features new exercises that can all be done in a classroom setting. Copies are available for $14.95, plus shipping and handling. Or you can purchase both DVDs (Brain Breaks 1 & 2) for $17.95, plus shipping and handling. Please include your name and address and tell us how you plan to use the DVD(s). Clinicians and public health officials recommend that children engage daily in 60 minutes of moderate to vigorous physical activity, such as brisk walking, running, cycling, or playing outdoors. However, opportunities for children to be physically active during school days have decreased in most schools across the United States. Additionally, time spent on sedentary activities like watching TV or playing computer and other video games is increasing. More than 95 percent of America's school-aged children are enrolled in school. Aside from the time spent at home, schools are the places where children spend most of their time. Most experts—supported by many research studies—agree that physical activity improves children's health. Yet, most children don't get enough physical activity during the course of their days. Due to shrinking budgets and pressures to improve academic test scores, formal physical education (PE) has been substantially reduced in most of Oregon’s Elementary Schools. We surveyed 384 elementary schools in Oregon to assess the average number of PE classes per week and the length of these PE classes. To provide children with more activity breaks during their school day, we recruited sports exercise and media students from Oregon State University to produce an exercise DVD called Brain Breaks: Classroom Fitness for Children. The short segments of physical activity breaks in the DVD are demonstrated by OSU sports exercise students, OSU student athletes, and local school children. They can all be done in a classroom setting. All the segments were filmed in the KVBR Studio, a student-run television station on the Oregon State University campus. They include include stretching and flexibility, strengthening and aerobic moves such as jumping in place. *Active Education. Physical Education, Physical Activity and Academic Performance. Active Living Research. Building Evidence to Prevent Childhood Obesity and Support Active Communities. Research Brief Summer 2009. Retrieved from www.activelivingresearch.org. Kid-tested recipes for the whole family. Let's Cook cookbooks are now available! Please include your name and address. We will ship your cookbook within a week! At the Healthy Youth Program, we strive to make our programs financially feasible to all youth by offering full and partial scholarships. Each fiscal year (i.e. July 1, 2015 - June 30, 2016), participants are eligible to receive one full scholarship that can be applied to any session of any program. Subsequently, participants are eligible to receive partial scholarships (50% of the program cost) for all programs for the remainder of the fiscal year. Please note: this is NOT a registration form. Program registration must be completed before completing a scholarship application. Nota: Este NO es un formulario de inscripción. La inscripción del programa debe ser completada antes de llenar la solicitud de beca. Youth will be introduced to their kitchen space and learn about kitchen safety with an emphasis on safe knife usage. Youth will be introduced to some basic culinary terms, basic meal timing principles and chopping techniques. Youth will explore how to substitute ingredients in recipes. They will learn how to replace unhealthy ingredients with healthier options and how to adjust a recipe when they are missing an ingredient. Youth will explore different ways to prepare fruits and vegetables and other common ingredients to change the texture and flavor for a variety of different dishes. Youth will review chopping techniques and be introduced to basic culinary terms and cooking techniques. Many of these topics are woven throughout each session of Master Chefs. The information included in this document is meant as a resource guide for instructors. In addition, wherever possible, links have been provided to relevant Healthy Youth Program handouts. When using Internet Explorer, be sure to disable compatability mode.